I thought everybody had a stiff neck and sore shoulders by three in the afternoon! I can't believe the source of all this pain is in my mouth. Temporomandibular joint dysfunction syndrome (TMJ) is the name given to an array of symptoms, the majority of which are related to muscle spasms. The muscles involved in the spasms are those which control the movement of the lower jaw. Because we walk on two legs instead of four, these muscles also balance the head, neck, and shoulders. Why do these muscles go into spasm, with disturbing and sometimes debilitating consequences? The easiest way to explain the reasons for the dysfunction is to describe the normal workings of the jaw and the temporomandibular joint. Your upper teeth are connected rigidly to your skull. Slightly in front of your ears, on your skull, is a specially shaped bone called the temporal bone. 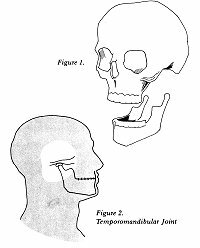 The lower jaw, which is called the mandible, is a horseshoe-shaped bone; its free ends rise upward and end in structures called condyles (see Figure 1) The joint between the temporal bone of the skull and the condyles of the mandible is called the temporomandibular joint (see Figure 2). If you put your fingers in your ears, press forward, and open. and close your mouth, you can feel the condyle move. When you open your mouth, only the lower jaw moves. You can see this for yourself when you look in the mirror and open and close your mouth. Although you have a temporomandibular joint on each side of your head, the two condyles directly affect each other's movement. The reason is that the lower jaw rigidly connects them. When we talk about movement in the joint, we refer to movement occurring on both sides. 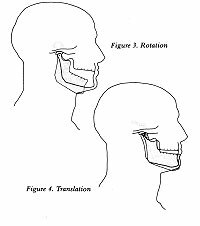 The temporomandibular joint produces two kinds of movement. It can rotate, making a movement like a door hinge (see Figure 3). It can also translate, that is, slide smoothly, much like a ski gliding across the snow (see Figure 4). The condyle can translate and rotate at the same time. When you begin to open your mouth, the condyle rotates for a very short time. After the initial rotation, it translates forward. Because the condyles are connected by the jawbone, a side-to-side movement produces motion on both sides. If you move your jaw to the left, the right condyle will move down, forward, and in. The condyle on the left will rotate and move outward. Moving your jaw to the right will produce the same motions in reverse. The temporomandibular joint has a protective cartilage disc between the upper and lower bones. The disc cushions the bones and prevents them from touching each other. The joint also has ligaments, which act as wires to limit the jaw's range of motion. Between the skull and the lower jaw are groups of paired muscles that control the jaw's movement. These muscles are called the muscles of mastication. To give the whole picture, it's necessary to describe these muscle groups and their location. We speak of a muscle in the singular, but remember that each of these has a twin on the other side of the head. Three pairs of muscles are mainly responsible for closing the mouth. 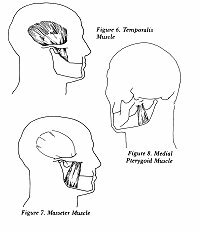 These are the Temporalis, the Masseter, and the medial pterygoid (see Figures 6,7,8). To open the mouth, Mylohyoid and Digastric muscles work through a chain of other muscles to pull the lower jaw down. The small Lateral Pterygoids are located deep within the jaw (see Figure 9). Although they have one name, they are actually two muscles originating from the same bone in the skull. One of these muscles connects to the condyle, and as the muscle contracts it pulls the condyle forward. Because of the various restricting ligaments, contraction of the muscle moves the jaw open. The second of the Lateral Pterygoids is connected to the disc, and its main purpose is to position the disc when the jaw is closed. The skull and jaw mechanism is balanced precariously at the top of the spinal column. The spinal column rests on the pelvis, which is in turn supported by the legs. At the upper part of the body, the arms are supported by the rib cage and shoulder complex (see Figure 10). The muscles connect bone to bone over joints. When muscles contract—shorten their length—they flex the joint. Muscles have no ability to push. 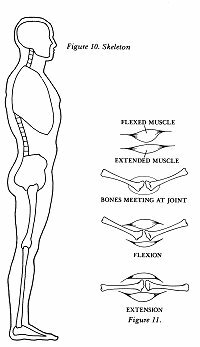 They can only be pulled back to their normal resting length when other muscles flex the joint in the opposite direction. The muscles that do this are usually on the other side of the joint (see Figure 11). In the front of the body, the muscles extend from the toes, up the front of the legs, through the pelvis and abdomen, up to the ribs and shoulders, to the front of the neck, and then connect to the lower jaw. The muscles in the back of the body go from the heel through the Achilles tendon, up the back of the legs, the pelvis, the spinal column, ribs, shoulders, and finally end up at the base of the neck on the skull ( see Figure 12). 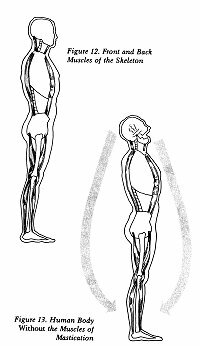 For us to stand upright, the muscles in the front and the back of the body must be co-ordinated. The muscles of mastication assume this job because of their location between the front and back muscles. This co-ordination function is in addition to their job of opening and closing the jaw. 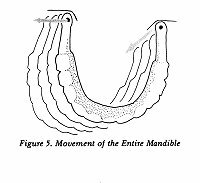 Were it not for the muscles of mastication, we would walk with our heads thrown back, our mouths wide open, looking at the sky (see Figure 13). For us to function normally and carry out all the motions and activities we engage in every day, each of these muscles must work in a co-ordinated fashion with every other muscle. If for any reason a muscle is stressed, it affects all the other muscles in the chain from our toes up through our jaws and down again to our heels. Because of this interdependency, the muscles of mastication have a profound effect on our posture and the ways our bones move (see Figure 14). Our muscle system, plus the nerves, sensors, and reflexes that control it, are given a collective name: the neuromuscular system. Most of the time, the neuromuscular system works on an unconscious level. We don't think about the millions of movements we carry out every day. We become conscious of our movements only when this workhorse system needs to protect itself. Like most systems in the body, the neuromuscular system possesses a marvellous ability to take care of itself, or at least minimize damage. Consider what happens when you walk down the street, step off a curb, and twist your ankle. You may be conscious of pain. Usually you are able to regain your balance and composure and keep on walking. But if the twist was severe enough, you may limp. The limp is the neuromuscular system's way of protecting a potentially injured component. The limp is an example of the way muscular activity in a leg will follow a repeatable pattern. Because of each muscle's dependence on the whole group, this pattern—in this case a limp—will create a corresponding change in movement patterns in all the other muscles interconnected to it in the chain. Usually our injuries are slight. The pain of a twisted ankle is gone in a day or two. But if an injury is severe and we limp for a long time, then other muscular problems such as backache are likely to occur. Muscles are muscles. The muscles of mastication are no different from any others. However, the temporomandibular joint is different from all other joints in its ability to rotate and slide. Even more significant, it has a set of gears connected to it, and each of its parts is forced to mesh. The gears are teeth or tooth replacements such as dentures. You may not think of your teeth as gears, but that's exactly their function in this mechanism. The teeth, the structures that surround them, and the temporomandibular joint contain sensors for the neuromuscular system. These sensors program the way the jaw moves, similar to the way a computer program will determine how the computer functions. If there is any abnormality, the neuromuscular system will try to defend the jaw, teeth, and muscles from injury. 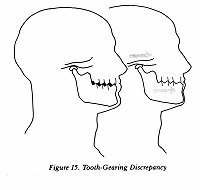 A common abnormality is a gearing problem between the teeth and the temporomandibular joint. If a gearing problem exists, then the neuromuscular system programs reflex movements for the lower jaw to help minimize damage to the teeth, their supporting structures, and the temporomandibular joint. This creates a situation in which the jaw is "limping," much as we limp with an injured ankle. If life were perfect, the jaw could go merrily along protecting itself. All the other muscles would adjust and compensate for the compensation already being made by the muscles of mastication. This is the way it usually happens. Most people are able to get along quite well. But unfortunately, muscles can sometimes be unforgiving of being pushed beyond their normal physiologic limits for any length of time. The most common way for a muscle to rebel is to go into spasm—what we sometimes call a charley horse. This condition is a painful contraction of the muscle. One side effect of a muscle spasm is that it sends a message back to the central nervous system. The central nervous system then interprets this signal and causes the muscle in spasm to contract even more. Now the problem is more than the triggering effect of a tooth-gearing problem. The spasm itself has caused a problem: more painful contraction. When a muscle is in spasm, its change in motion may affect other muscles. The muscle spasm, through the central nervous system, creates more contraction, which then creates more spasm, and this cycle goes on and on. Because the muscles of mastication co-ordinate muscles of the back and front of the body, any changes in these muscles can result in postural problems and spasms elsewhere. Now that you understand how the body supports, balances, and protects itself, it's easy to see the cause of some of the symptoms of TMJ. Because the muscles of mastication are on the head, spasms in these muscles may result in headaches. 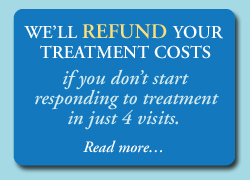 Pain can be, and often is, referred to other areas. Referred pain is pain experienced in an area away from the actual cause. Referred pain can be bizarre and may appear to be unfounded. If the muscle spasms happen to be in one of the muscles that connect the skull to the spinal column and shoulders, this may result in aching, stiffness, and restricted movements in the neck and shoulders. Any muscle that is forced to change its normal range of motion has the potential to go into spasm. This is true of the entire chain. Thus, we see back pain or stiffness in TMJ patients. We even see, although rarely, TMJ symptoms exhibited in the hamstring muscles and in the calves. Muscle pain may make sense. But why, you ask, would some patients with TMJ have symptoms such as ringing or buzzing in the ears, earaches, dizziness, or even altered hearing? A little muscle called Tensor veli palatini is responsible. This muscle has many duties, one of which is to close off the eustachian tubes. The eustachian tubes connect the throat to the middle ear and are responsible for making air pressure in the closed chamber of the middle ear equal to air pressure outside. This occurrence is rarely noticeable. You probably do notice your eustachian tubes at work when you clear your ears during an elevator ride or in flight. The Tensor veli palatini muscle gets its signal from a branch of the same nerve that supplies the external pterygoid muscle, one of the chief muscles involved in TMJ. 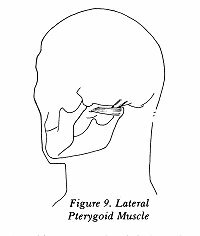 When the external pterygoid muscle goes into spasm, the Tensor veli palatini also can contract because of the spasm/ contraction feedback mechanism. Hence, with closed eustachian tubes, and an inability to equalize middle-ear pressure, a patient can experience symptoms that mimic middle-ear problems. Another frequently reported symptom is numbness in the hands and feet. There is a logical, if a bit complicated, reason for this. The spinal column encloses the spinal cord, which is the main nerve network connecting the brain to the rest of the body. Nerves move from inside the spinal column to the outside by passing through openings between the bones of the spinal column. Because of the interweaving of muscles between the bones of the spinal column, the nerves must pass between layers of muscles. If these muscles are in spasm, they may squeeze the nerves as they travel from the cord to the fingers or toes. This can create numbness, which can be mistaken for symptoms of neurological problems. TMJ is basically a muscle-spasm problem. Because of this, standard diagnostic tests, blood work- ups, EEGs, or X-rays yield no information for a correct diagnosis. Often a sufferer is led to believe that little can be done for the problem except to block the pain rather than attacking the reason for it. Sometimes a label is put on the headache— migraine is a common one—not as a true diagnosis, but in an effort to calm the patient. 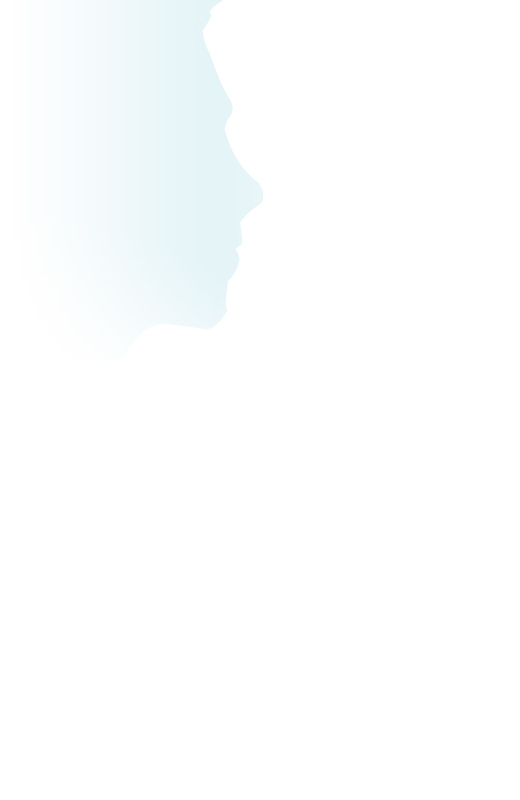 In many cases, attempts to relieve the pain are in vain, leaving the TMJ patient suffering and often feeling helpless. Although some people with tooth-gearing problems have muscle spasms, others with the same problems don't. Why are some patients with a tooth-gearing problem symptomatic and others not? Why do people with symptoms experience them with such varying severity and frequency? We don't know why some people are susceptible to muscle spasms; this is still a medical mystery. We can only observe that some people appear to be more susceptible than others. This is the same kind of mystery as why some people rarely have infections or colds, and others exposed to the same environment are constantly sick. Some people seem to be constitutionally stronger than others. Susceptibility, pain, and the pain threshold concept can't be separated when discussing muscle spasms and their accompanying symptoms. When a person's threshold to pain is high, a muscle spasm may occur without pain. A person becomes symptomatic when either the spasm becomes worse or the patient's pain threshold drops. Sometimes both of these things happen. It's still a mystery why a person's threshold to pain changes, although stress is sometimes given as a cause. We also don't know at what point a patient will experience pain with a muscle spasm. However, the degree of the muscle spasm will go up and down in the course of the day in response to varying stress levels. At a certain point, a spasm will be felt as pain. The threshold level is the point at which the person experiences pain. We know that a person's threshold to stimuli tends to increase as the stimuli remain. If we cut ourselves, we may feel no pain at first and then experience intense pain when we begin tending to the cut. But, as we know from experiencing this kind of injury, the pain usually drops to a tolerable level after a short time. With TMJ problems that become symptomatic, we don't know for sure if stress necessarily lowers the threshold or increases the spasm. Perhaps both of these things happen. But because the level of spasms and threshold change constantly, people sometimes have intermittent symptoms: bouts with neck and shoulder aches on stressful days, headaches at five in the afternoon every day, more severe symptoms when the body is stressed by unrelated illness, or headaches when especially tired. When people have mild headaches, for example, and take an over-the-counter pain reliever, the central nervous system's response to the pain stimulus changes. In effect, when the pain reliever works, the person no longer feels the pain because his or her threshold has been raised. However, with TMJ patients, when symptoms are severe, neither over-the-counter medications nor prescription drugs are effective in raising the patient's threshold to the pain stimulus caused by the muscle spasms. Much can be done to correct the source of the muscle spasm and eliminate symptoms. But treating TMJ symptoms can't even begin until the problem is diagnosed. Treatment for TMJ depends on an accurate diagnosis of the condition. Fortunately, as described in the next chapter, diagnostic techniques are available.